Over 40 Amateur Of The Week: Rob Got Stronger With Age! Years of boxing and military training made Rob grow mentally and physically. This Canadian is prepared for battle on the competition stage at age 42! As a young boy, I was an amateur boxer and constantly needed to lose weight in order to make my weight class. Needless to say, although I was in great shape, I didn't have much muscle mass. I joined the Canadian Military as an infantry soldier and served my country for six years. While in the Army, I organized and planned the Canadian Forces Bodybuilding Show. I had the opportunity to compete at the time, but didn't because I let insecurities dictate my life. Unfortunately, I let life obligations take over in my 30s, and although I still worked out, I wasn't focused and didn't have a plan. When my 40s came, I bet myself that I would knock an item off my bucket list and step on stage. I started a year and half ago used Bodybuilding.com as my first tool to get motivated and on track. As a youth, I was thin and didn't have confidence. My father introduced me to boxing and I excelled at a rapid pace (I won golden gloves and the Provincial Championships). I joined the Army at age 17, quickly filled out, and started weight training at age 18. I had a goal and enjoyed watching my body change. I pushed my body to the limit and my 8-year-old daughter told me I look like Superman. People who told me I was crazy to compete in my 40s only fueled my desire to compete. 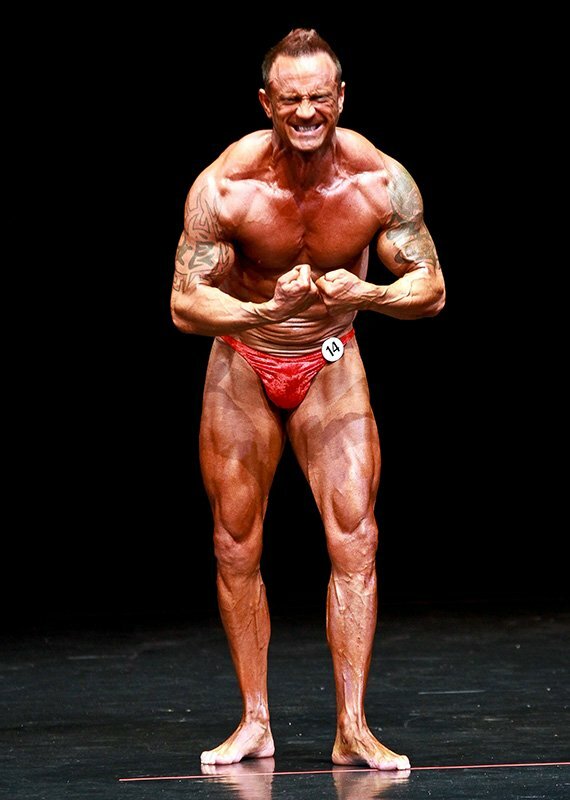 My family and Bodybuilding.com were my main sources of inspiration and motivation. They kept me on track throughout my journey to the competition stage. I plan to compete in the 2014 Provincial Championships after my last year's placing allowed me to move onto the next level. Train smart and listen to your body. Gyms are littered with injured people who didn't ask questions or use proper form. Bodybuilding.com started me on my journey. It gave me confidence and guidance to follow through with my goals and aspirations. Kris Gethin's program was instrumental during my bulking stage. The BodySpace members who post their diets and pre-contest strategies helped me immensely. The cost associated with supplements and dieting is huge. Bodybuilding.com prices are the lowest anywhere.